Nigel Lawson who was an ardent pro-european tory both during Thatchers regime and for several decades afterwards, therefore his latest announcement that he would vote for Britain to leave the European Union in an referendum has come as bit of a bolt out of the blue, akin to Margaret Thatcher revealing that she was always a closet socialist. Nigel Lawson as Chancellor of the Exchequer continuously battled against his Prime Minister during the Thatcher years as he pushed towards greater integration with Europe. In fact Lawson along with the then Foreign Secretary pushed for Britain to join the Exchange Rate Mechanism ahead of a single currency. And it was Lawson's and Howe's resignations that ultimately triggered the Coup against Thatcher. Now the same Nigel Lawson who has been wrong on the European single currency for several decades has the gall to stand up and say that Britain should leave the europe union, lacking any credibility, something that the Gold fish memory mainstream media fails to recognise. "I strongly suspect that there would be a positive economic advantage to the UK in leaving the single market, quite apart from the more important economic gains I have already listed. Before we joined the European Common Market, as the EU was then known, far too much of British business and industry felt secure in the warm embrace of what was still known as Imperial Preference and was reluctant to look farther afield. It took entry into the Common Market to bring about a recognition of the opportunities on our doorstep." The problem is that leaving an economic union is always going to be far more painful than joining a union as the Euro-zone PIIGS nation are discovering today, that whatever the pain they are enduring, what would follow an exit out of the Euro-zone and EU would be a far worse hyperinflationary collapse of their economies. 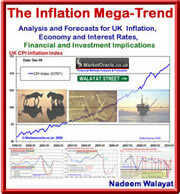 Yes, Britain could in a referendum vote to leave the European Union, but the people of Britain should prepare themselves for very high inflation and unemployment rising to at well over 3 million for several years the conclusion of which would be for a reduction in real GDP of about 9% or twice that of the Great Recession of 2008-2009. In the immediate term the only real benefit of leaving the european union would be that Britain would no longer have to pay its annual membership fee of about £9 billion a year which is about 1.5% of government spending, another saving would be on being forced to contribute towards bailing out bankrupt euro-zone nations. In the longer term, British businesses freeing themselves to some degree from ever expanding european red tape, an example of which is the annoying cookies nonsense where virtually every UK website has to repeatedly flash a message that cookies are being stored on user computers, should then become more profitable as they are able to channel more resources towards doing business rather than trying to comply with ever expanding european union bureaucracy. In my opinion it is far too difficult to determine if Britain would be better of in the long-run from exiting from the European Union, however in the short-term i.e. the next 5 years it is highly probable that Britain would be significantly worse off. Meanwhile the mainstream press is busy speculating what David Cameron should do with regards a proposed 2017 referendum on the EU, whilst missing the obvious point that UKIP's high poll ratings are the nail in the coffin for the Conservatives chances of winning the next general election, which is something that I concluded soon after the 2010 Election (12 May 2010 - Gordon Brown Mission Accomplished, Labour General Election Plan a Magnificent Success ), and little has changed since for Labour remains on a trajectory for a strong election win in 2015, ensure you remain subscribed to my always free newsletter for wealth protection strategies from the coming high inflation consequences.